The Village Players have once again assembled an impressive cast an crew for their upcoming production of Almost, Maine. I recently spoke with the play's director, Dan Maloney, about the show. Maloney is not only proud of the show's upcoming production, but also passionate about importance of community theater. Maloney is certainly no stranger to the world of theater. He has been involved in theater in various capacities for the past thirteen years. He started working with the Village Players back in 2011 during their production of The Lunacy of Love. "It’s mostly been a serendipitous relationship," said Maloney. "The group embraced me with open arms, and we happened to be a good fit for each other. Since then, I’ve been directly involved with three other Village Players productions including directing 2012’s award-winning production of The Curious Savage. Now, I’m just trying to pay it forward by welcoming new members while helping the group grow artistically." This production of Almost, Maine has been two years in the making for Maloney and the Village Players. 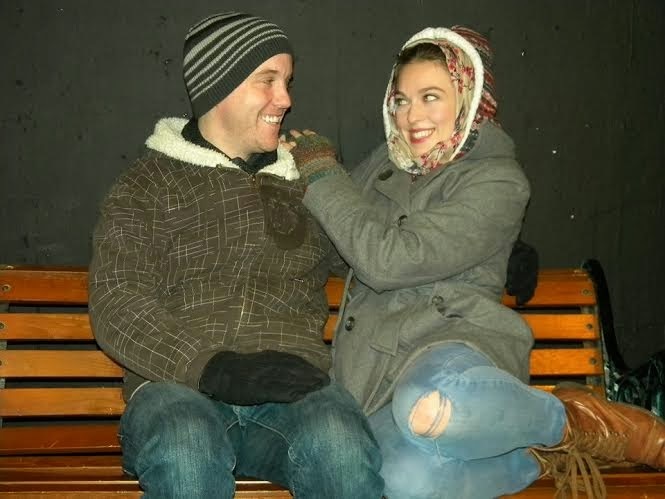 "I brought Almost, Maine to Village Players back in the winter of 2012 as we were trying to determine our 2012-2013 season, and the group fell in love with it. However, the way the season shook out, there simply wasn’t a place for it last year, but I was encouraged to bring it back again this year," said Maloney. Maloney provides us with a perfect insight into the story of Almost, Maine, and the characters you will meet throughout the show. "Almost, Maine is about honest, hardworking people who are excited by love and other extraordinary events. It could be classified as a 'romantic comedy,' but that’s probably too narrow a definition. While I expect the audience will laugh heartily, they may shed a tear or two as well. Even as a comedy, this play recognizes that love is hard and even painful sometimes. Yet, there is still something magical and elusive about it, and our need for it – in all its forms – is what makes us human," said Maloney. Almost, Maine's audition process began in October 2013. "The unique thing about Almost, Maine is it’s described by the playwright, John Cariani, as a play for 'as few as four (with actors doubling parts) or as many as nineteen actors.' Going into auditions, I wasn’t sure which way I was going to cast it, but halfway through, it was clear to me we had more than enough talent to cast each role." The production has brought together an impressive mix of actors. The cast spans spectrum of theater performers. The show will feature everything from first time actors to seasoned theater veterans boasting over twenty years of experience. The cast consists of actors from throughout Northern Kentucky and Cincinnati. Rehearsals kicked off on January 8, 2014 with two nights of table reads. At the table reads, Maloney and the cast also discussed the play's major themes. "From there, we blocked all the scenes individually, and now, it’s a matter of putting together all the puzzle pieces, so to speak. I try to give the cast something new to work on every rehearsal, whether it’s learning the blocking, getting off book, adding props or costumes, and eventually mixing in lights and sound. Rehearsing a show is like training for a marathon: you don’t want to overdo it all it once, but you want to make sure you’re pushing yourself a little further each day," said Maloney. According the Maloney, this production is truly "putting 'community' back in community theater." One of the many great aspects of the Village Players is that it showcases local talent while also providing a creative outlet for those interested in the performing arts. "The thing I find most exciting about community theatre is that a group of people take time out of their busy lives to come together and create something out of nothing," said Maloney. "At the heart of the creative process is discovery. In trying to create something new, we discover things about each other and ourselves we may not have realized otherwise. And maybe, if we’re lucky, we'll grow as people and become stronger community members because of it." Over the years, Village Players has created a great place for the community to support other talented members of the community. Maloney believes that Almost, Maine is the perfect show for a city like Ft. Thomas. "I think the Fort Thomas community will identify with the salt-of-the-earth, small-town residents of Almost. Plus, it’s the perfect show for February – the month of love," said Maloney.